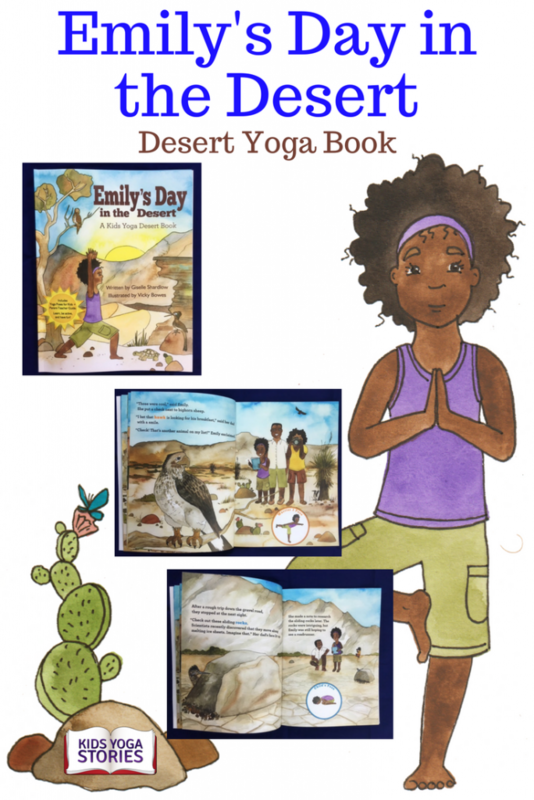 Learn about desert animals through desert yoga poses and desert books for kids! 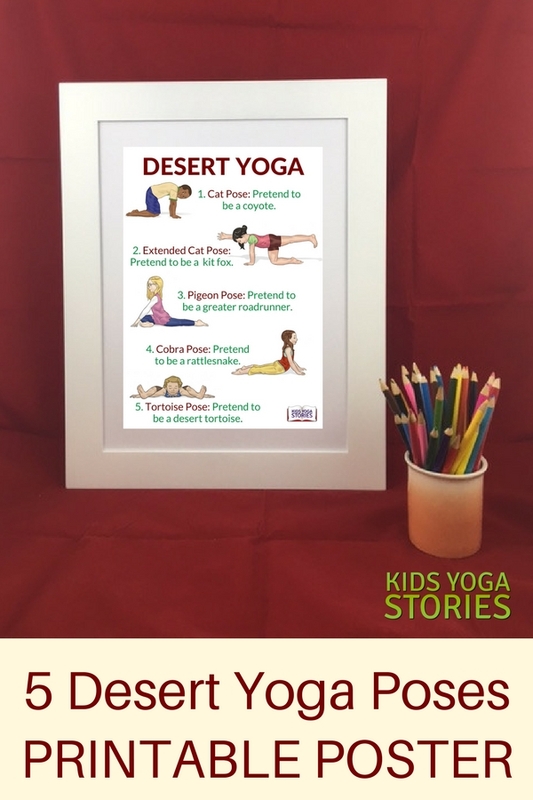 Try a desert theme for one of your kids yoga classes. Dash like a kit fox, slither like a rattlesnake, and peek out of your shell like a desert tortoise. Our family went on a trip through the Southwest in a RV a couple years ago, and recently, my daughter pulled out the mini-book that I’d created for her with our travel photos. We talked about the desert, and I read her Emily’s Day in the Desert, the yoga book based on our visit to Death Valley, California. We then found a bunch of desert books for kids in the library and talked about the unique animals that live in the desert. 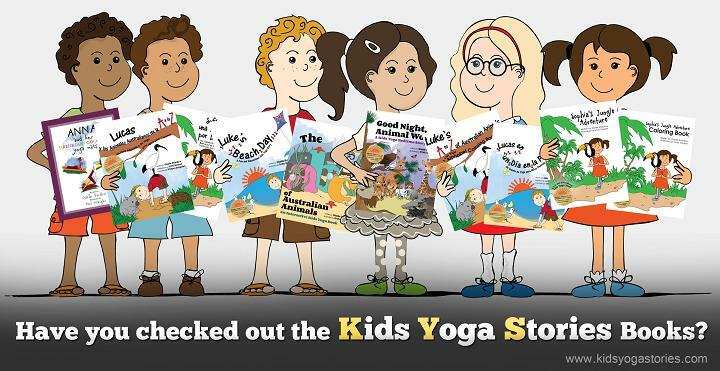 Below you’ll find our favorite desert books and five desert animal yoga postures for kids to bring your learning alive through movement! A great research book to plan your desert lesson. I love the double-spread illustrations of flora and fauna of each American desert. A charming rhyming text similar to “Over in the Meadow” to learn about desert animals. I bought this book at the Death Valley visitor’s center in California for my toddler, and she loved it. This is another book that I bought in the Death Valley visitor’s center, that my daughter loved when she was a toddler. 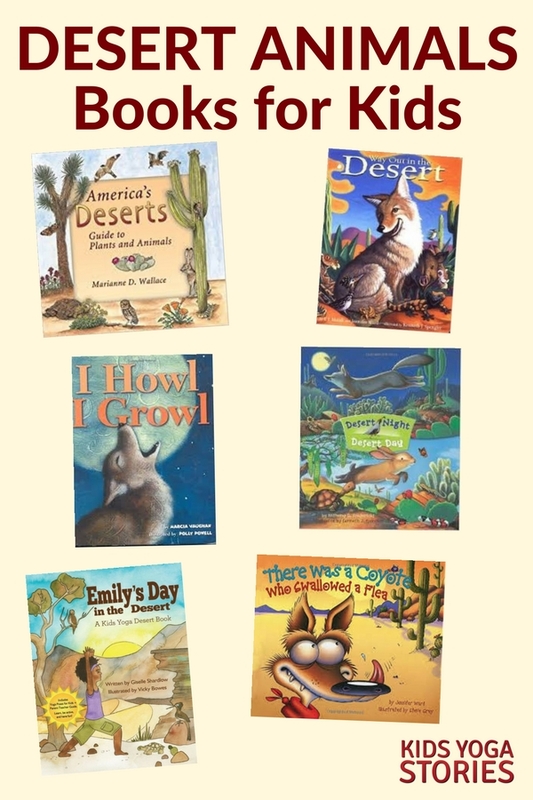 Each page labels the desert animal and what they do: chase, race, growl, or howl. 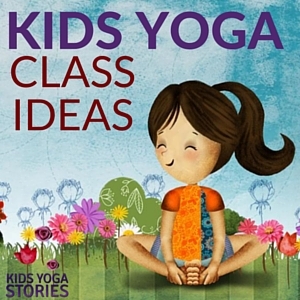 It’s an easy book to use for a kids yoga class. A silly cartoon-illustrated book following the “There Was a Lady Who Swallowed a Fly” rhyming text. A desert book that has both beautiful, bright illustrations and lovely rhyming text. I love the introduction of both nighttime and daytime deserts (guide at back of the book). Join Emily as she spends a day with her parents in Death Valley, California. Glide like a hawk, dart like a fox, and slither like a snake. 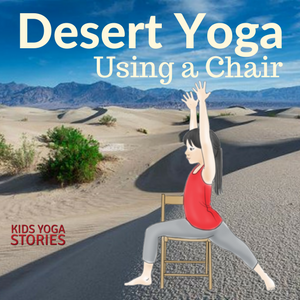 This desert yoga book includes a list of yoga poses for kids and a parent-teacher guide. Join a young girl as she walks down into the Grand Canyon. Spend twenty-four hours in the Sonoran Desert and learn about the animals and plants that come alive during all the hours of the day. A well-presented non-fiction book about deserts around the world. Join Ms. Frizzle and her class to learn about deserts. A rhyming Cat in the Hat book to learn about deserts. A rendition of the Three Little Pigs, except with desert animals. 1. CAT POSE – Pretend to be a coyote. On all fours, round your back and tuck your chin into your chest. Pretend to be a coyote. 2. EXTENDED CAT POSE – Pretend to be a kit fox. From all fours, extend one leg out behind you, and look forward. Take the opposite arm out in front of you to counter balance. Pretend to be a kit fox darting across the road. Repeat on the other side. 3. PIGEON POSE – Pretend to be a greater roadrunner. From a Table Top position, bring your right knee to rest behind your right hand, angling your right foot slightly inward, and pretend to sprint like a roadrunner. Repeat on the other side. 4. COBRA POSE – Pretend to be a rattlesnake. Come down to lie on your tummy and place your palms flat next to your shoulders. Pressing into your hands, lift your head and shoulders off the ground. Hiss like a rattlesnake. 5. TORTOISE POSE – Pretend to be a desert tortoise. Come to sit on your buttocks with your knees bent and your feet flat on the floor. Then take your feet out wide and be sure you are sitting with a tall, straight spine. Slide your arms under your knees and place your hands flat on the floor outside your legs. Bend forward, keeping your back and neck straight. Pretend to be a tortoise poking its head out of the shell. What other desert animal poses did you come up with? What did you learn about desert life? Stand tall like a desert bighorn sheep, soar like a red-tail hawk and scurry like a scorpion. 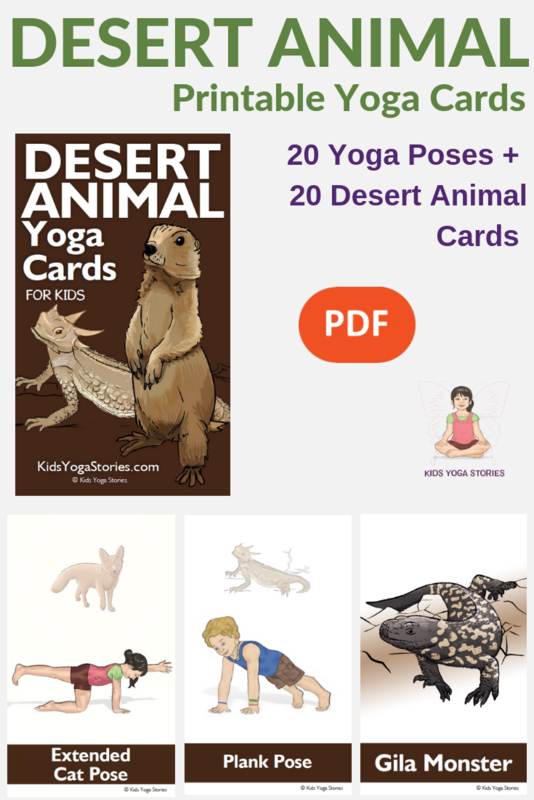 Discover the magic and awe of desert animals through these beautifully illustrated Desert Animal Yoga Cards for Kids. Download your Desert Animal Yoga Cards here. Learn about the desert through movement + story! Join Emily as she spends a day with her parents in Death Valley, California. Glide like a hawk, dart like a fox, and slither like a snake. 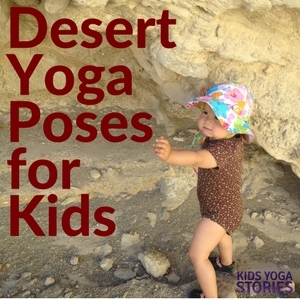 This desert yoga book includes a list of yoga poses for kids and a parent-teacher guide. Ages 4+.